Florida's real-life Joker, aka Lawrence Patrick Sullivan, has been arrested again. In May 2017, Sullivan was arrested for waving a loaded firearm at oncoming cars in Miami. Scared citizens called the police, stating that a man dressed like the Joker was pointing a gun at them. He was arrested with a Smith and Wesson handgun with six live rounds and later waived his right to a public defender because he didn't want to fill out the paperwork. Now, he's up to his old tricks, but this time in another Florida county. Lawrence Patrick Sullivan was arrested in Pinellas County earlier this week for a probation violation pertaining to a concealed-carry firearms offense. It's not clear if this is the same offense from May of last year. However, Sullivan, who apparently had a good stay in jail last time, is being held without bail. 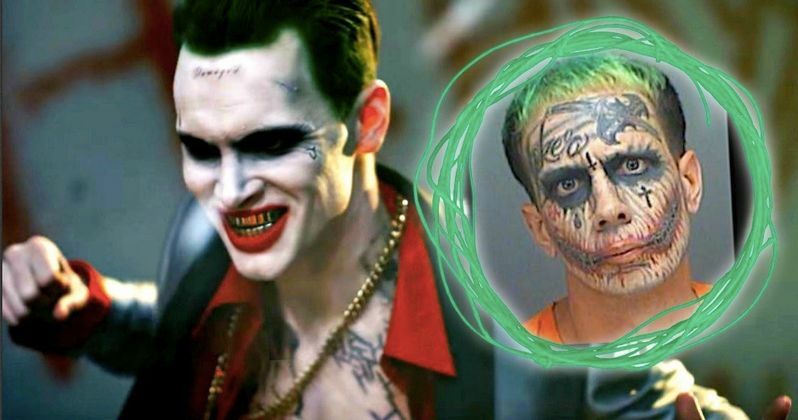 Sullivan said that his Joker tattoos helped him out while being locked up. He went on to say, "I was treated like a celebrity inside. I was on the psych floor cause' I take medications." Since last year, Lawrence Patrick Sullivan, aka the Florida Joker, has gotten even more tattoos. In addition to his Joker look and his f*ck Batman tattoo on his forehead, he now has an upside down cross right between his eyes. According to the police report, he also has new tattoos of a sword, a marijuana leaf, the Grim Reaper, and Freddy Krueger, which is pretty interesting. Sullivan's looks is based off of Jared Leto's portrayal of the Joker from 2016's Suicide Squad, with more of a hip look, as opposed to how Joaquin Phoenix looks in the upcoming Joker movie. At the time of his arrest last year, Sullivan's mother defended him. She had this to say. "He's a good kid. He has a lot of tattoos. But he's a nice kid with some problems. He is mentally disabled and is handicapped." When Lawrence Patrick Sullivan was asked about having a permit for the weapon that he had last year, he responded by saying that he didn't because they were "too expensive." Looking at the concealed weapon laws in Florida proves that Sullivan could get up to 5 years in prison. With the probation violation, he could be looking at a third degree felony as well as a $5,000 fine and five years of formal probation. If he really does have a disability, it might be time to help Sullivan out. There is no court date set for Lawrence Patrick Sullivan at this time, but it doesn't look good for the real-life Florida Joker. Hopefully some of that celebrity treatment helps him out in his latest jail stint. Additionally, one would hope that he will get the mental services that he needs to prevent him from going back to jail and let him continue to be a "tattoo model." This story was first reported by The New York Post.